Digital UltraViolet and Digital Copy will makes it possible for you to stream the movie Captain Marvel HD Vudu or iTunes Code via MA instantly to your computer and compatible Smartphones, Andriod, iphone, iPod Touch, iPad and tablets devices anytime, anywhere. 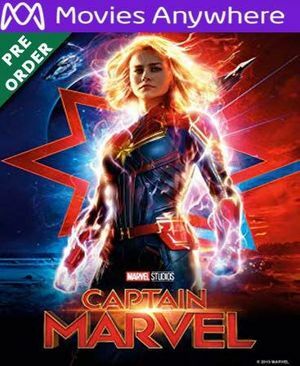 You can also download a Digital UltraViolet Copy or a Digital Copy of the movie Captain Marvel HD Vudu or iTunes Code via MA to your computer and compatible devices. Set in the 1990s, Marvel Studios' Captain Marvel is an adventure from a previously unseen period in the history of the Marvel Cinematic Universe that follows the journey of Carol Danvers as she becomes one of the universe's most powerful heroes. When a galactic war between two alien races reaches Earth, Danvers finds herself and a small cadre of allies at the center of the maelstrom.